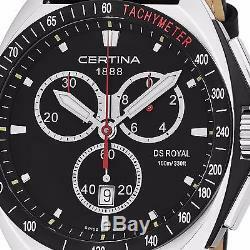 Certina Men's DS Royal Black Dial Strap Chronograph Quartz Watch C0104171605101. Certina can look back on 125 years of tradition. Even though modern technology, tastes and expectations have changed the face of watchmaking forever, many of the core values remain, and Certina is still just as passionate about the art of timekeeping as it was over a century ago. With roots dating back to 1888, the Swiss sport watch brand has good reason to be attached to its history. Case: Brushed and polished stainless steel, with black accents, hypoallergenic 316L. Bezel: Matte black PVD coated stainless steel, tachymeter scale engraved. Calendar: Date display window at the 6 o'clock position. Subdial; Three, small seconds at the 6 o'clock position, chronograph 30 minute counter at the 10 o'clock position and a 1/10th of a second counter at the 2 o'clock position. The acronym DS stands for Double Security or Double Safety. It is a famous Certinas system for the protection of the watch movement against all negative external influences, such as pressure, temperature, moisture, shock and dust. All DS watches are characterized by strong technological advantages to insure flawless. Strap: Black leather, with contrast stitching. Water resistance: 10 ATM/100 meters/330 feet. Case measurements: 42 mm in diameter x 12.75 mm thick. Strap measurements: 22 mm wide x 8 inches long. Box measurements: 6 inches wide x 6 inches long x 5 inches high. Model: C010.417.16.051.01. All measurements are approximate and may vary slightly from the listed dimensions. 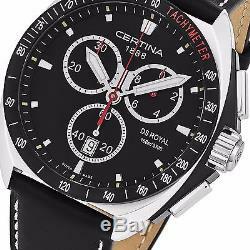 We offer authentic, brand name luxury and fashion watches at highly discounted prices. We stand behind our products and strive to provide the best customer service to ensure you have a pleasant shopping experience with us and are 100% satisfied. If you have any questions or issues, please message us. Leaving feedback, we will always do our best to satisfy our customers. We cannot mark it as a gift. Failure to do so may result in refusal of package. Are your watches new or used? How do I know that my watch is authentic? The authenticity of the watch can be confirmed via the serial number that is engraved on the back of the case of the watch. We guarantee our watches to be authentic and we are willing to stand behind every watch we sell. Do your watches come with serial numbers? All our watches come with the original serial numbers on the back of the case. This ensures the authenticity of your watch. How are you able to sell your watches for so cheap? We are not authorized dealers of the brands that we sell. Do your watches come with a box and papers? Who will repair my watch when it breaks? How long does it take to receive my watch? What type of payments do you accept? Do I have to be available to sign for the package? We recommend that you follow the tracking to ensure that someone will be available to receive and sign for your package. 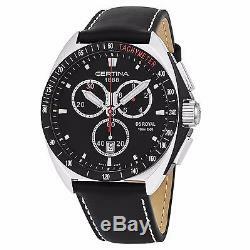 The item "Certina Men's DS Royal Black Dial Strap Chronograph Quartz Watch C0104171605101" is in sale since Thursday, July 20, 2017. This item is in the category "Jewelry & Watches\Watches, Parts & Accessories\Wristwatches". The seller is "sigmatime" and is located in Brooklyn, New York. This item can be shipped to United States, Canada, United Kingdom, Denmark, Romania, Slovakia, Bulgaria, Czech republic, Finland, Hungary, Latvia, Lithuania, Malta, Estonia, Australia, Greece, Portugal, Cyprus, Slovenia, Japan, Sweden, South Korea, Indonesia, Taiwan, South africa, Thailand, Belgium, France, Hong Kong, Ireland, Netherlands, Poland, Spain, Italy, Germany, Austria, Israel, Mexico, New Zealand, Philippines, Singapore, Norway, Saudi arabia, Ukraine, United arab emirates, Qatar, Kuwait, Bahrain, Croatia, Malaysia, Brazil, Chile, Colombia, Costa rica, Panama, Trinidad and tobago, Guatemala, Honduras, Jamaica, Antigua and barbuda, Aruba, Belize, Dominica, Grenada, Saint kitts and nevis, Saint lucia, Montserrat, Turks and caicos islands, Barbados, Bangladesh, Bermuda, Brunei darussalam, Bolivia, Ecuador, Egypt, French guiana, Guernsey, Gibraltar, Guadeloupe, Iceland, Jersey, Jordan, Cambodia, Cayman islands, Liechtenstein, Sri lanka, Luxembourg, Monaco, Macao, Martinique, Maldives, Nicaragua, Oman, Peru, Pakistan, Paraguay, Reunion.